The Wine & Food Foundation of Texas is introducing a brand new Austin food and drink event. 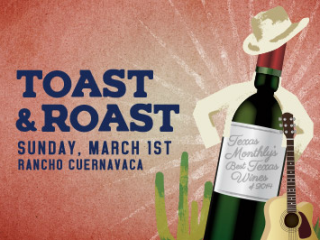 Presented in association with Texas Monthly magazine, Toast & Roast will provide the perfect platform to showcase Texas food and wine while celebrating Texas Independence Weekend. Enjoy an exclusive tasting of Texas Monthly’s Best Texas Wines of 2014 as well as a feast of grilled pig, goat and lamb prepared by chef John Bates of Austin's Noble Sandwiches. Wines from Fall Creek Vineyards and Pedernales Cellars will complement the meal as well as live music from Sour Bridges. $100 general admission; $80 for members.